I’m not afraid to admit that I love “Despicable Me“. Typically, Little Girl and myself watch it once a day when I am home during the week. Every morning she asks to watch “Mr Gru”, so I pop it in, let her push play at her demand, then we cruise over to the couch and just veg out. It’s wonderful. Words cannot describe this joy of having such a quality time with my girl. Most of the time, I get very bored of watching the same thing over and over. Of course, this is a double edged sword of sorts in that I have two toddlers, both wielding a strong desire for some of the worst television programming either. In fact, I won’t even list them out of my extreme dislike for those said shows. But “Despicable Me” is one flick that I never get tired of. Each time I watch it I feel like I get a new laugh, a new sigh, or even an epiphany. I find little things that I haven’t noticed the first thousand times I watched it. Have you ever tried to pay attention to each minion in a wide shot? They are doing some pretty hilarious things in the background. I started thinking more and more about the aspects of fatherhood portrayed in the movie and how Gru adapts to and learns to accept these new feelings of love for the little girls. I looked at his attitude in the beginning, the point in which he starts to change, and of course the ending where he has been transformed. It is very interesting to sit there and pick it apart. I try each time to find something in any stage of the character’s development that I can identify with. 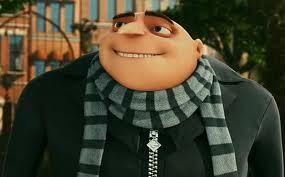 Of course, there is a part of each element of Mr. Gru that I relate to, and it is sometimes a scary relation at that. I can see my anger in him. I can see my fears in him, and I can see my joys in him. But then again, I think we all can. All of us have been scared of that love at one point. We have all felt anger at one point. And we have all been overcome with the joy that our children bring us. So, I guess in a way, we are all Mr. Gru. We are all little sinister evil villains that try to steal the moon with a shrink ray. No wait, that’s just the movie character. What I meant to say was this: We are all Mr. Gru in that we are all human. We are all fathers. We are all human fathers. Part of the human experience for us is to raise a child from birth until they are adults. Even then, it never really stops. It’s just all part of the experience. And what a great one it is. It sounds like our household starts off about the same. Interesting. I like the movie because it’s funny, and it goes to show, as you pointed out, that being human is about evolving as a person and father. Thanks for the comment. Awesome that your daughter likes to watch it too! Amazing what animated movies can really teach ya huh? Sounds like I might need to sit down and watch that Movie! 🙂 thanks for the recommendation! Reminds me of my younger brother when we where kids he use to watch the same things over and over again. Looking at how much my daughter replicates his behaviour I might have to do the same for her when she gets older!